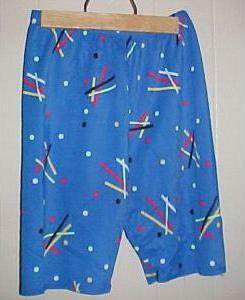 These Activate shorts I won at an eBay auction in 2004. Seller was sportingguy27, and it was given this description at the auction: You are bidding on a great pair of Lycra Spandex Workout Shorts by Ac-Ti-Vate. They are made of a very stretchy Lycra Spandex Material. They are in great used condition as seen in the picture. It is a size Adult Large. These are great for the next big match, working out in, hangin out, or just lounging around.